Frustrated by a health care system that was forcing them to work inefficiently, three skilled surgeons came together in 2011 and did something about it. They designed and built the hospital of their dreams, a facility focused on the needs of patients and surgeons rather than bureaucracy. In short order, their Crescent City Surgical Centre became not only a center of excellence for certain medical specialties, but a hospital of choice for patients in the New Orleans area. With proof of their new business model’s viability, the Crescent City team hoped to create similar facilities throughout Louisiana. And that’s how nationally recognized physicians Tom Lavin, Chad Millet and Najeeb Thomas, specialists in bariatrics, orthopedics and neurosurgery, respectively, came to GulfStar for advice. Over the next several months, GulfStar conducted a targeted process that ultimately narrowed the field of interested parties to LCMC Health, one of the largest nonprofit health care systems in the Gulf South region. These two organizations were a natural fit, as both were determined to improve the way health care is delivered on a larger scale. Together, they could achieve their expansion goals and at the same time, offer patients exceptional care and an overall better experience at a reasonable cost. LCMC Health’s CEO Greg Feirn appreciated the Crescent City team’s philosophy and business strategy. By involving surgeons as well as their chief of nursing and CFO in all management decisions, Crescent City had created an environment where patients and staff alike clearly thrived. They had no tolerance for waste and made no compromises in providing patients the highest quality, most appropriate medical care. LCMC offered to become a minority owner of Crescent City, an ideal situation for all concerned. 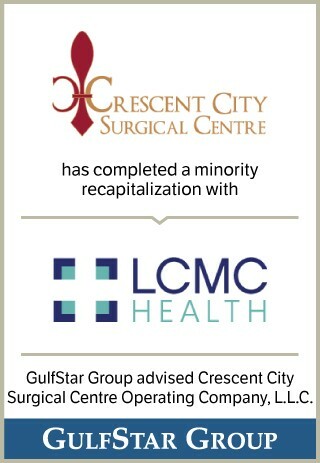 GulfStar ensured that the deal was structured properly to protect both LCMC Health’s investment and Crescent City’s operational independence.